Monash BDI PhD student Kate Balka. Monash University awards one Silver Jubilee Postgraduate Research Scholarship by rotation to faculties each year. That means that our PhD students only have the opportunity to receive the scholarship once every five years. This is a prestigious award of Monash University. In 2019, the recipient of the scholarship is the top ranked applicant in the Monash Biomedicine Discovery Institute (BDI), Kate Balka. 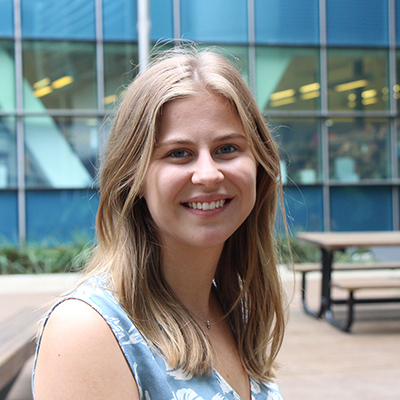 Kate commenced her PhD candidature in mid-February 2019 in the Kile lab where she will focus on the interplay between innate immunity, apoptosis and mitochondrial homeostasis. While completing her honours year at the Walter and Eliza Hall Institute, Kate gained a passion for the signalling pathways that underlie the innate immune system. “My work to date has focused on the cGAS-STING pathway, which is important for provoking an immunogenic response to double stranded DNA present within the host cell cytosol,” Kate said. “I’m very excited to be embarking on my PhD within the Kile lab and feel honoured to have received this prestigious scholarship to support my PhD studies. I look forward to working in such a fantastic research environment,” she said.